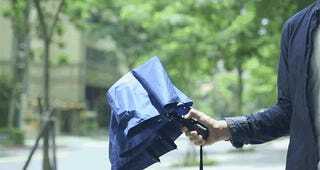 Your umbrella might pop open at the push of a button, but does it close all the way too? You probably need to grab its soaking wet canopy to retract it all the way, which is why the completely automatic HAZ smart umbrella doesn’t actually seem that ridiculous, does it? But wet hands isn’t the only problem the HAZ promises to solve. It also boasts smart features like a constant Bluetooth connection to your phone so that if you leave the umbrella somewhere by accident, you’ll get an immediate notification that it’s not only been forgotten, but where it was last connected to your device so it’s easy to find. If you lose umbrellas more often than coat check tickets, the HAZ might be the last one you ever own. Still not sold on spending $69 for an umbrella? You might be if you’ve ever stepped outside on a rainy morning and wished you’d checked the forecast before you left. The HAZ also comes with a free accompanying app that’s constantly keeping an eye on the weather for you. If it’s raining out, or if there’s rain predicted for later in the day, it will remind you to pack the umbrella just in case. So not only will you never forget it when you don’t need it, you’ll also never forget it for when you do. You might want to hold off on tossing your current umbrella in the trash, though. The HAZ does sound like an amazing upgrade, but it’s actually only available through an Indiegogo campaign trying to raise $15,000 to turn the working prototype into a production and consumer-ready version. A $69 donation to their cause will guarantee you one of the first models to roll off the assembly line, but not until October of this year at the earliest—if everything goes well. By that time who knows how many regular umbrellas you’ll have broken or forgotten, but that’s just all the more reason to finally splurge on one.